The Swapper was recently on Steams Halloween sale, and having heard a lot of positive buzz about it this past summer, I decided to take the plunge and give it a go. Giantbomb praised it in their podcast, and I felt this indie studio needed all the help they could get, and in hindsight, £3.50 wasn’t a pad price to pay for such a solid game. The game starts out with some fantastic cut scenes that starts with your character being sent to a planet from a space station. Upon landing, you can take control of your character, and proceed to explore the planet on which you’ve landed. Eventually, you come across a strange looking device, one that allows you to make clones of yourself and switch your “soul” between them. It’s an interesting premise, one that The Swapper makes good use of, with puzzles that’ll push you to your limits and an atmosphere that’ll make you feel like you’re there. The graphics are lovely for a 2.5D game, reminding me of Deadlight that I played previously in the year. Hyper-realistic and gorgeously rendered, it wouldn’t look strange in a 3D setting. Levels have multiple light sources, and the game was overall bug free, but did have slow downs when dying multiple times in the same level, which I assume is a garbage collection problem with the code not recycling assets fast enough. Overall, the aesthetics are easily one of the best things about The Swapper, with art and style notches above the rest of the games industry at this moment in time. Using your 4 clones can be difficult at times, but here’s an easy example with how most puzzles play out. Puzzles start off fairly easy, with the first few involving pressure pads to open doors. Relatively straight forward but enjoyable to solve, these puzzles start becoming a lot harder with the introduction of red and blue lights that stop some of your abilities of your gun. Red lights still allow you to produce clones, but don’t allow you to swap into them, where as blue lights do the opposite, allowing for swapping into clones but not producing them. It plays with your mind in weird and wonderful ways, ensuring you’re constantly thinking of new ways to use your gun; not a simple task by any means for a game that has a simple game mechanic/premise. Eventually you’ll come across purple lights (that will stop both replicating and swapping), and wind turbines that will invert gravity, leading to harder puzzles that were pushing me to my limit. The ending can only be accessed once you’ve completed each and every puzzle, so be prepared to spend hours and countless live’s trying to solve some rooms puzzles, as they certainly get hard. 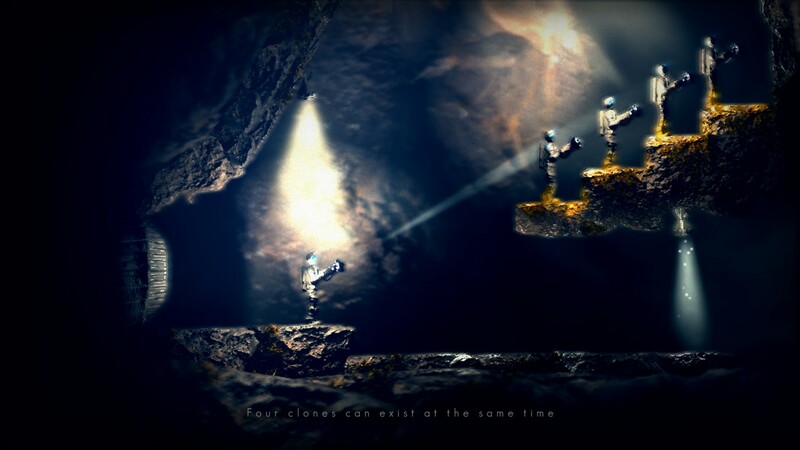 There are several main characters throughout the story of The Swapper, with the player being a blank slate to explore and learn about this wonderful world. There’s no aliens per-say, but rocks discovered on the planet and brought up to the space station talk to you as you pass them, adding a nice piece of depth to the world. The story of the Swapper takes place through logs you find in terminals, a trope of a story telling mechanic if there ever was one, but an effective one none the less. Each log can be accessed at any time, with each one giving the perspective of a female on board the space station, and the rocks that you pass, allowing the player to read/invest into the story as much or as little as they’d like. 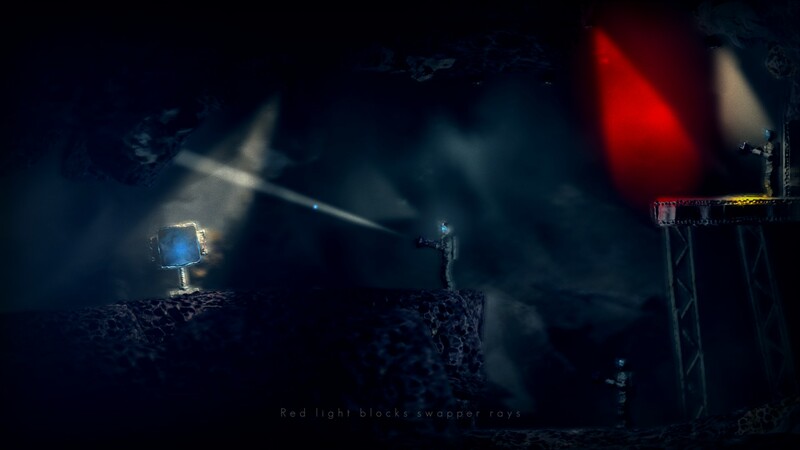 It’s an overall unique and creepy tale, with life and one’s soul being questioned, especially when sentient rocks are involved, making the player question life and philosophy. 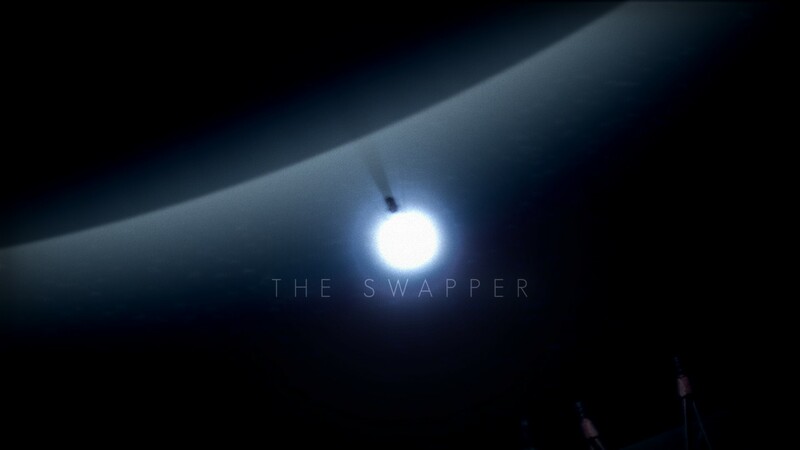 The Swapper is fairly linear, with the player being able to explore the space station as they please, but with little to no result for doing so. Rooms become boring and stale once the puzzle has been solved, with the only extras available to the player being the secret rooms and terminals that have extra logs on them after a certain point in the story. It results in the game taking roughly 4-5 hours to complete, but with the game not being very re-playable. This is understandable with every puzzle game due to the very nature of once a puzzle is solved, it can easily be done again and again. The story, though intriguing, is fairly simple, which didn’t have me coming back for more. The only thing that may change on your second playthrough would be the ending, which allows you a choice, which once chosen, cannot be done again due to your save file being deleted. Going to Youtube and searching for the alternate ending may be the best method of seeing all that The Swapper has to offer. Time slows down when you make a clone, allowing you to scale huge distances quickly by generating a clone and swapping with them. 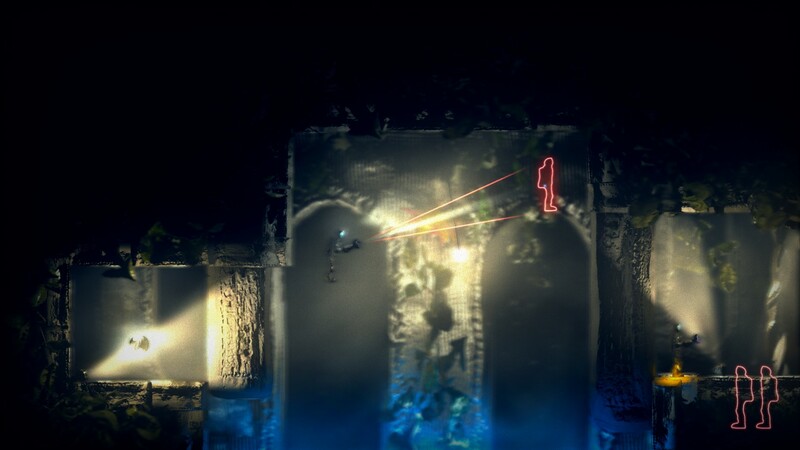 It’s a fantastic gameplay mechanic that makes The Swapper a nice and unique puzzle game, whilst also incorporating platforming techniques. In conclusion, I thoroughly enjoyed my time with The Swapper, its unique puzzle elements were certainly entertaining for the duration of the campaign, and didn’t outstay their welcome. A second game with slightly improved mechanics might be fantastic, but wouldn’t be needed, as The Swapper is fantastic as a stand alone game. Given how much I enjoyed the game, I’d easily recommend it to friends and family for it’s full price, and if it ever goes on sale again you’d be grabbing yourself a bargain.